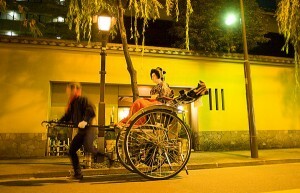 You can call Sayuki and other Fukagawa geisha out from Fukagawa to have dinner with you anywhere in Tokyo (as long as it is a nice restaurant suitable for geisha!). This costs 40,000 yen per geisha for the minimum two hour engagement (plus the return taxi fare from Fukagawa). 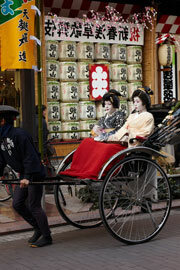 If the geisha come to have dinner with you in a restaurant they don’t: eat so you only need to pay your own dinner costs. If you only have time to have a dinner at your hotel this is a good option. But remember that if you want the geisha to dance and perform for you, you will need to book a room in a Japanese-style restaurant. You can come to one of the tea-houses in Fukagawa for dinner. This costs an average of around 20,000 yen per customer including everything, but it depends on numbers. For only two customers it might cost a little more; for more than ten it could cost a little less. If you come to Fukagawa you get to see the very beautiful tea-houses and the geisha in their normal environment, and experience the best of Japanese tea-house cuisine. And of course you also get to enjoy the full experience of watching the geisha perform their arts so this is a good option if you have the time. Finally! I have been looking for a place like this for a long time.